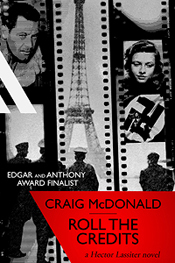 "A writer of truly unique voice, approach, and ambition, Craig McDonald delivers again with Roll the Credits. Hector Lassiter is a compelling character but also a fascinating forum for McDonald's historical, social, and artistic observations. For all the wonderful action, slick dialogue, and plot twists McDonald throws at the reader, he's equally interested in saying something substantial about time and place. Not to be missed." World War II: the last good fight. In his own words, novelist Hector Lassiter confides the secret history of his clandestine campaigns in the European theatre and beyond, and his long, bloody battle of wits against a Nazi filmmaker. Aided by a beautiful OSS operative and a two-fisted Irish cop-turned-Army intelligence officer, Hector takes on the impossible mission of smuggling a hard-hunted Jewish orphan from France while pursued by the might of Germany's occupying army. The high-stakes chase extends from decadent Berlin to occupied France, from post-war Hollywood to the steaming jungles of Brazil. A dazzling fusion of crime fiction and espionage thriller, Roll the Credits is also a haunting study of the birth of film noir and the bloody underbelly of cinematic history, with a supporting cast including icons of the Lost Generation and heroes of the French resistance.